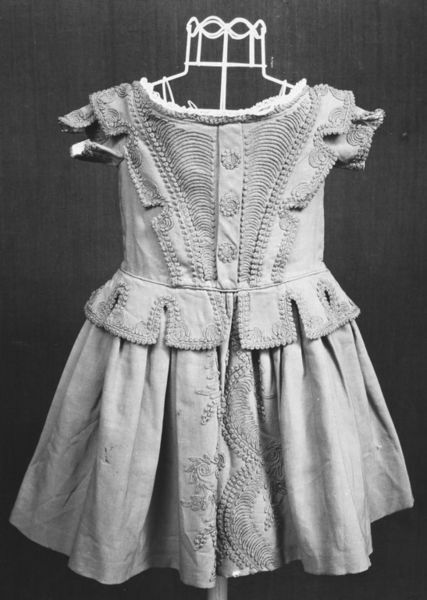 Boy's dress of red wool trimmed with laid and couched red woollen braid in rows of curving patterns, and lined with white linen. 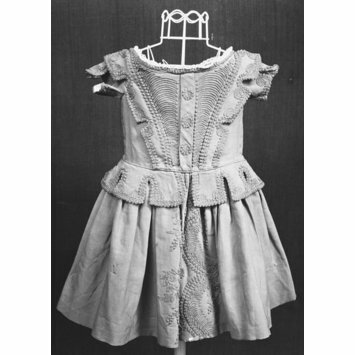 The dress has a rounded neck and short sleeves, and is tabbed at the waist. The garment fastens at the back with hooks and eyelet holes. The red shade of the fabric has not faded and was probably produced using the 'Turkey red' dyeing process. Given by Miss E Pickett (RF 51/ 1736), and said by her to have been worn by her grandfather 96 years previously.